Note 1: Reposted from WUWT. Note 2: “IPCC” is the International Panel on Climate Change, a U.N. body driving the fearmongering associated with “Catastrophic Climate Change” due to man’s activities, especially the myths concerning carbon dioxide emissions. By Dr. Tim Ball, March 21, 2014. Inadequacies are confirmed by the complete failure of all forecasts, predictions, projections, prognostications, or whatever they call them. It is one thing to waste time and money playing with climate models in a laboratory, where they don’t meet minimum scientific standards, it is another to use their results as the basis for public policies where the economic and social ramifications are devastating. Equally disturbing and unconscionable is the silence of scientists involved in the IPCC who know the vast difference between the scientific limitations and uncertainties and the certainties produced in the Summary for Policymakers (SPM). “Deficiencies in the accuracy, quality and continuity of the records place serious limitations on the confidence that can be placed in the research results. Remember this is 11 years after Hansen’s comments of certainty to the Senate and five years after the 1995 IPCC Report. It is worse now with fewer weather stations and less data than in 1990. Schneider also set the tone and raised eyebrows when he said in Discover magazine. Scientists need to get some broader based support, to capture the public’s imagination…that, of course, entails getting loads of media coverage. So we have to offer up scary scenarios, make simplified dramatic statements, and make little mention of any doubts we may have…each of us has to decide what the right balance is between being effective and being honest. The IPCC achieved his objective with devastating effect, because they chose effective over honest. A major piece of evidence is the disparity between the Working Group I (WGI) (Physical Science Basis) Report, particularly the Chapter on computer models and the claims in the Summary for Policymakers (SPM) Report. Why did the scientists who participated in the WGI Report remain so silent about the disparity? Changes (other than grammatical or minor editorial changes) made after acceptance by the Working Group or the Panel shall be those necessary to ensure consistency with the Summary for Policymakers (SPM) or the Overview Chapter. The Summary is written then the WGI is adjusted. It is like an executive publishing findings then asking employees to produce material to justify them. The purpose is to present a completely different reality to the press and the public. 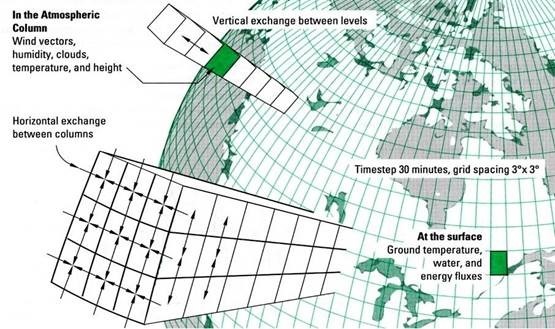 Here is a simple diagram of how the atmosphere is divided to create climate models. Figure 1: Schematic of General Circulation Model (GCM). Despite the many improvements, numerous issues remain. Many of the important processes that determine a model’s response to changes in radiative forcing are not resolved by the model’s grid. Instead, sub-grid scale parameterizations are used to parametrize the unresolved processes, such as cloud formation and the mixing due to oceanic eddies. Interconnections mean errors are spread and amplified. Imagine the number of calculations necessary that even at computer speed take a long time. The run time is a major limitation. All of this takes huge amounts of computer capacity; running a full-scale GCM for a 100-year projection of future climate requires many months of time on the most advanced supercomputer. As a result, very few full-scale GCM projections are made. A comment at Steve McIntyre’s site, Climateaudit, illustrates the problem. Caspar Ammann said that GCMs (General Circulation Models) took about 1 day of machine time to cover 25 years. On this basis, it is obviously impossible to model the Pliocene-Pleistocene transition (say the last 2 million years) using a GCM as this would take about 219 years of computer time. So you can only run the models if you reduce the number of variables. O’Keefe and Kueter explain. As a result, very few full-scale GCM projections are made. Modelers have developed a variety of short cut techniques to allow them to generate more results. Since the accuracy of full GCM runs is unknown, it is not possible to estimate what impact the use of these short cuts has on the quality of model outputs. Omission of variables allows short runs, but allows manipulation and moves the model further from reality. Which variables do you include? For the IPCC only those that create the results they want. Besides, because climate is constantly and widely varying so a variable may become more or less important over time as thresholds change. … current climate modeling is essentially to answer one question: how will increased atmospheric concentrations of CO2 (generated from human activity) change earth’s temperature and other climatological statistics? Neither cosmology nor vulcanology enter the equations. It should also be noted that observations related to sub-surface ocean circulation (oceanology), the prime source of internal variability, have only recently commenced on a consistent global scale. The bottom line is that IPCC’s view of climate has been through a narrow prism. It is heroic to assume that such a view is sufficient basis on which to predict future ‘climate’. 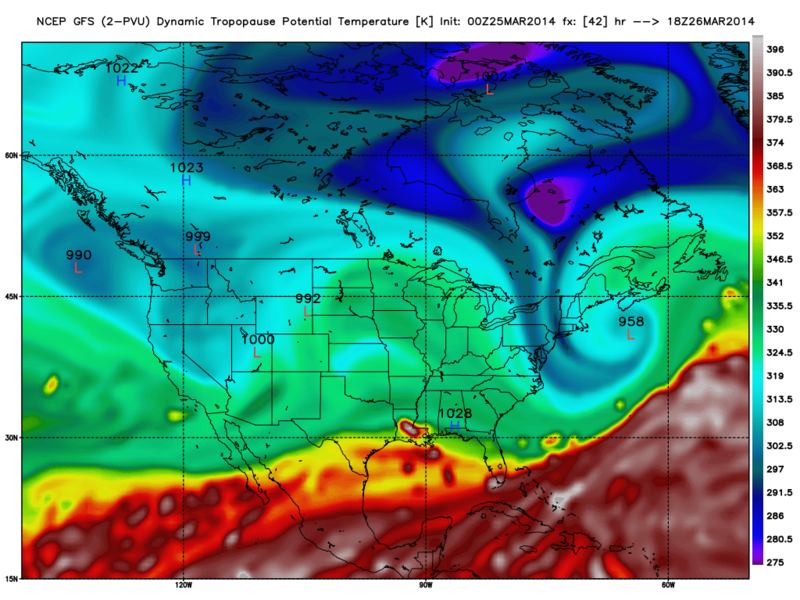 Static Climate Models In A Virtually Unknown Dynamic Atmosphere. Consequently, for models to predict future climatic conditions reliably, they must simulate the current climatic state with some as yet unknown degree of fidelity. Poor model skill in simulating present climate could indicate that certain physical or dynamical processes have been misrepresented. The history of understanding the atmosphere leaps 2000 years from Aristotle who knew there were three distinct climate zones to George Hadley in the 18th century. The word climate comes from the Greek word klima for slope referring to the angle of the sun and the climate zones it creates. Aristotle’s views dominated western science until the 16th century, but it wasn’t until the 18th century wider, but still narrow, understanding began. In 1735 George Hadley used the wind patterns, recorded by English sailing ships, to create the first 3D diagram of circulation. Restricted only to the tropics, it became known as the Hadley Cell. Sadly, today we know little more than Hadley although Willis Eschenbach has worked hard to identify its role in transfer of heat energy. The Intergovernmental Panel on Climate Change (IPCC) illustrates the point in Chapter 8 of the 2007 Report. 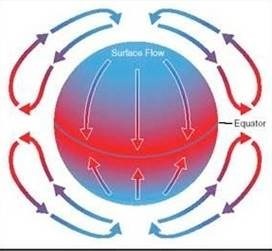 The problem for climate science and modelers is the Earth is spherical and it rotates. Rotation around the sun creates the seasons, but the rotation around the axes creates even bigger geophysical dynamic problems. 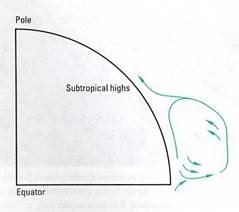 Because of it, a simple single cell system (Figure 2) with heated air rising at the Equator moving to the Poles, sinking and returning to the Equator, breaks up. 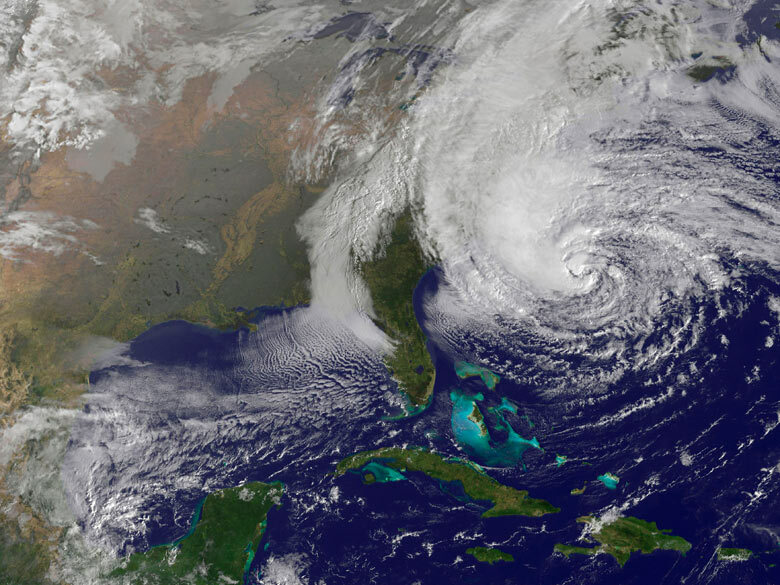 The Coriolis Effect is the single biggest influence on the atmosphere caused by rotation. It dictates that anything moving across the surface appears to be deflected to the right in the Northern Hemisphere and to the left in the Southern Hemisphere. It appears that a force is pushing from the side so people incorrectly refer to the Coriolis Force. There is no Force. Figure 2: A Simple Single Cell. Figure 3 shows a more recent attempt to approximate what is going on. Figure 3: A more recent model of a cross-section through the Northern Hemisphere. Now it is the “Indirect Ferrell Cell”. 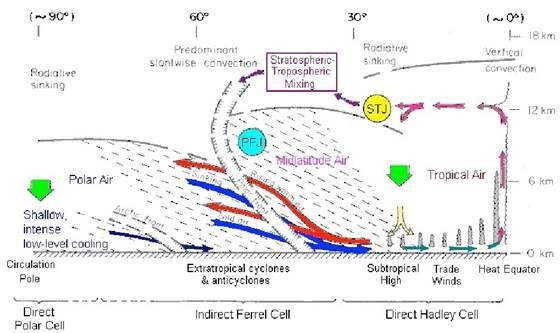 Notice the discontinuities in the Tropopause and the “Stratospheric – Tropospheric Mixing”. This is important, because the IPCC doesn’t deal with the critical interface between the stratosphere and a major mechanism in the upper Troposphere in their models. This is just one example of model inadequacies provided by the IPCC. What the IPCC Working Group I, (The Physical Science Basis Report) Says About the Models. The following quotes (Italic and inset) are under their original headlines from Chapter 8 of the 2007 IPCC AR4 Report. Comments are in regular type. There is currently no consensus on the optimal way to divide computer resources among finer numerical grids, which allow for better simulations; greater numbers of ensemble members, which allow for better statistical estimates of uncertainty; and inclusion of a more complete set of processes (e.g., carbon feedbacks, atmospheric chemistry interactions). We believe that there has not been a serious investigation to model the underlying process structures nor to model the present instrumented temperature record with sophisticated process models. FAQ 8.1: How Reliable Are the Models Used to Make Projections of Future Climate Change? 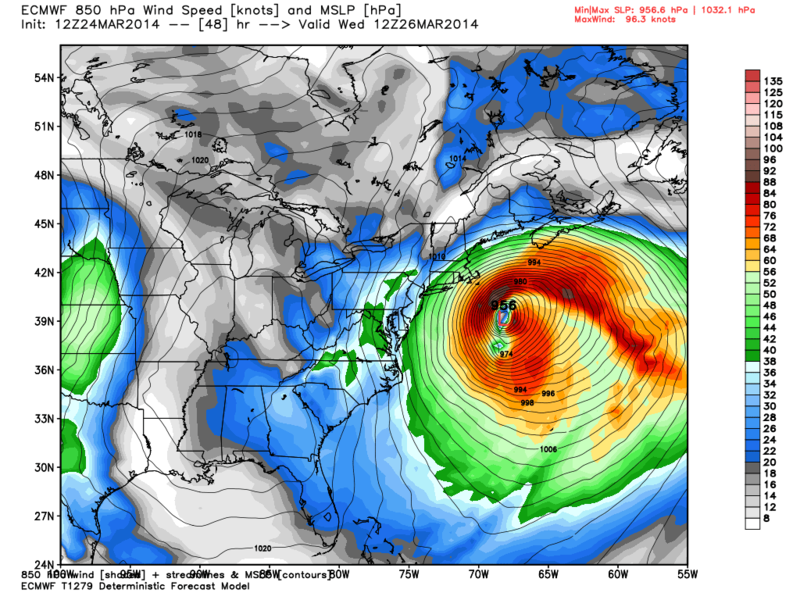 Nevertheless, models still show significant errors. Although these are generally greater at smaller scales, important large-scale problems also remain. For example, deficiencies remain in the simulation of tropical precipitation, the El Niño- Southern Oscillation and the Madden-Julian Oscillation (an observed variation in tropical winds and rainfall with a time scale of 30 to 90 days). Models continue to have significant limitations, such as in their representation of clouds, which lead to uncertainties in the magnitude and timing, as well as regional details, of predicted climate change. Nevertheless, over several decades of model development, they have consistently provided a robust and unambiguous picture of significant climate warming in response to increasing greenhouse gases. Of course they do, because that is how they are programmed. In this report, various models use spectral, semi-Lagrangian, and Eulerian finite-volume and finite-difference advection schemes, although there is still no consensus on which type of scheme is best. But how different are the results and why don’t they know which is best? The climate system includes a variety of physical processes, such as cloud processes, radiative processes and boundary-layer processes, which interact with each other on many temporal and spatial scales. Due to the limited resolutions of the models, many of these processes are not resolved adequately by the model grid and must therefore be parametrized. The differences between parametrizations are an important reason why climate model results differ. How can parameterizations vary? The variance is evidence they are simply guessing at the conditions in each grid and likely choosing the one that accentuates their bias. Issues remain over the proper treatment of thermobaricity (nonlinear relationship of temperature, salinity and pressure to density), which means that in some isopycnic coordinate models the relative densities of, for example, Mediterranean and Antarctic Bottom Water masses are distorted. The merits of these vertical coordinate systems are still being established. Since the TAR, there have been few assessments of the capacity of climate models to simulate observed soil moisture. Despite the tremendous effort to collect and homogenise soil moisture measurements at global scales (Robock et al., 2000), discrepancies between large-scale estimates of observed soil moisture remain. The challenge of modelling soil moisture, which naturally varies at small scales, linked to landscape characteristics, soil processes, groundwater recharge, vegetation type, etc., within climate models in a way that facilitates comparison with observed data is considerable. It is not clear how to compare climate-model simulated soil moisture with point-based or remotely sensed soil moisture. This makes assessing how well climate models simulate soil moisture, or the change in soil moisture, difficult. Evaporation is a major transfer of long-wave energy from the surface to the atmosphere. This inadequacy alone likely more than equals the change created by human addition of CO2. 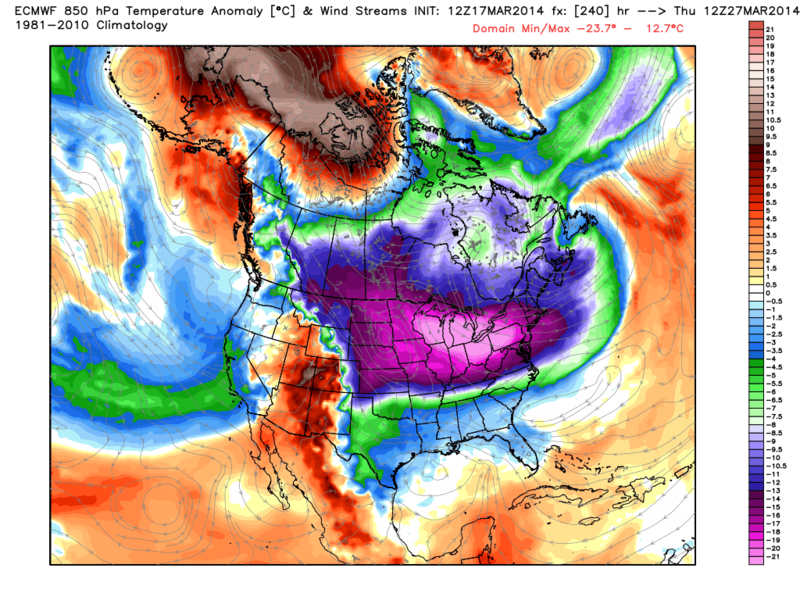 How big does an ice cap have to be to influence the parameterization in a grid? Greenland is an ice cap. Interactive atmospheric chemistry components are not generally included in the models used in this report. Due to nonlinearities in the processes governing climate, the climate system response to perturbations depends to some extent on its basic state (Spelman and Manabe, 1984). Consequently, for models to predict future climatic conditions reliably, they must simulate the current climatic state with some as yet unknown degree of fidelity. Poor model skill in simulating present climate could indicate that certain physical or dynamical processes have been misrepresented. They don’t even know which ones are misrepresented? 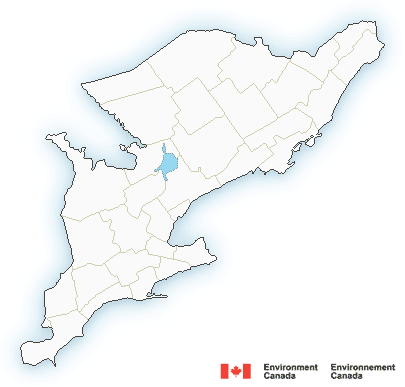 Precipitation forecasts (projections?) are worse than their temperature projections (forecasts). This is their self-serving assessment. How much are they improving and from what baseline? Comparisons of the type performed here need to be made with an appreciation of the uncertainties in the historical estimates of radiative forcing and various sampling issues in the observations. The temperature and salinity errors in the thermocline, while still large, have been reduced in many models. How much reduction and why in only some models? The magnitude and spatial distribution of the high-latitude climate changes can be strongly affected by sea ice characteristics, but evaluation of sea ice in models is hampered by insufficient observations of some key variables (e.g., ice thickness) (see Section 4.4). Even when sea ice errors can be quantified, it is difficult to isolate their causes, which might arise from deficiencies in the representation of sea ice itself, but could also be due to flawed simulation of the atmospheric and oceanic fields at high latitudes that drive ice movement (see Sections 8.3.1, 8.3.2 and 11.3.8). Vast areas of the land surface have little or no current data and even less historic data. These include 19 percent deserts, 20 percent mountains, 20 percent grasslands, 33 percent combined tropical and boreal forests and almost the entire Arctic and Antarctic regions. Evaluation of the land surface component in coupled models is severely limited by the lack of suitable observations. Why? In 1971-2 George Kukla was producing estimates of varying snow cover as a factor in climate change. Satellite data is readily available for simple assessment of the changes through time. Despite considerable effort since the TAR, uncertainties remain in the representation of solar radiation in climate models (Potter and Cess, 2004). Blocking events are an important class of sectoral weather regimes (see Chapter 3), associated with local reversals of the mid-latitude westerlies. There is also evidence of connections between North and South Pacific blocking and ENSO variability (e.g., Renwick, 1998; Chen and Yoon, 2002), and between North Atlantic blocks and sudden stratospheric warmings (e.g., Kodera and Chiba, 1995; Monahan et al., 2003) but these connections have not been systematically explored in AOGCMs. Blocking was a significant phenomenon in the weather patterns as the Circumpolar flow changed from Zonal to Meridional in 2013-14. The mechanisms, however, that control the variations in the MOC are fairly different across the ensemble of AOGCMs. In most AOGCMs, the variability can be understood as a damped oceanic eigenmode that is stochastically excited by the atmosphere. In a few other AOGCMs, however, coupled interactions between the ocean and the atmosphere appear to be more important. Despite this progress, serious systematic errors in both the simulated mean climate and the natural variability persist. For example, the so-called ‘double ITCZ’ problem noted by Mechoso et al. (1995; see Section 8.3.1) remains a major source of error in simulating the annual cycle in the tropics in most AOGCMs, which ultimately affects the fidelity of the simulated ENSO. The MJO (Madden and Julian, 1971) refers to the dominant mode of intra-seasonal variability in the tropical troposphere. Thus, while a model may simulate some gross characteristics of the MJO, the simulation may be deemed unsuccessful when the detailed structure of the surface fluxes is examined (e.g., Hendon, 2000). The Quasi-Biennial Oscillation (QBO; see Chapter 3) is a quasi-periodic wave-driven zonal mean wind reversal that dominates the low-frequency variability of the lower equatorial stratosphere (3 to 100 hPa) and affects a variety of extratropical phenomena including the strength and stability of the winter polar vortex (e.g., Baldwin et al., 2001).. Due to the computational cost associated with the requirement of a well-resolved stratosphere, the models employed for the current assessment do not generally include the QBO. Monsoons are defined by extreme seasonality of rainfall. They occur in many regions around the word, though most only associate them with Southern Asia. It is not clear what the IPCC mean. Regardless, these are massive systems of energy transfer from the region of energy surplus to the deficit region. 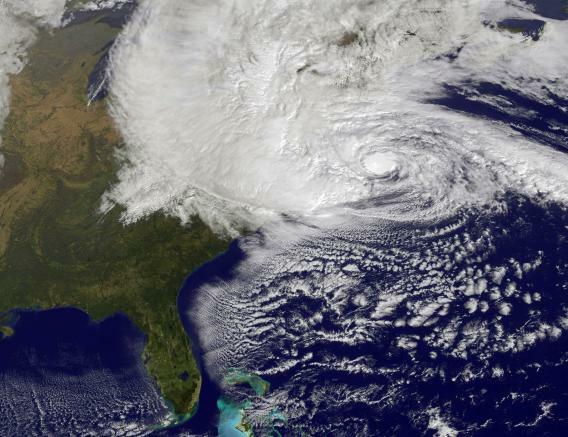 In 2008 Tim Palmer, a leading climate modeller at the European Centre for Medium-Range Weather Forecasts in Reading England said in the New Scientist. Sun et al. (2006) investigated the intensity of daily precipitation simulated by 18 AOGCMs, including several used in this report. They found that most of the models produce light precipitation (<10 mm day–1) more often than observed, too few heavy precipitation events and too little precipitation in heavy events (>10 mm day–1). The errors tend to cancel, so that the seasonal mean precipitation is fairly realistic (see Section 8.3). Incredible, the errors cancel and since the results appear to match reality they must be correctly derived. The climate sensitivity depends on the type of forcing agents applied to the climate system and on their geographical and vertical distributions (Allen and Ingram, 2002; Sausen et al., 2002; Joshi et al., 2003). As it is influenced by the nature and the magnitude of the feedbacks at work in the climate response, it also depends on the mean climate state (Boer and Yu, 2003). Some differences in climate sensitivity will also result simply from differences in the particular radiative forcing calculated by different radiation codes (see Sections 10.2.1 and 8.6.2.3). Climate sensitivity has consistently declined and did so further in IPCC AR5. In fact, in the SPM for AR5 the sensitivity declined in the few weeks from the first draft to the final report. 8.6.2.2 Why Have the Model Estimates Changed Since the TAR? The current generation of GCMs covers a range of equilibrium climate sensitivity from 2.1°C to 4.4°C (with a mean value of 3.2°C; see Table 8.2 and Box 10.2), which is quite similar to the TAR. Yet most climate models have undergone substantial developments since the TAR (probably more than between the Second Assessment Report and the TAR) that generally involve improved parametrizations of specific processes such as clouds, boundary layer or convection (see Section 8.2). In some cases, developments have also concerned numerics, dynamical cores or the coupling to new components (ocean, carbon cycle, etc.). Developing new versions of a model to improve the physical basis of parametrizations or the simulation of the current climate is at the heart of modelling group activities. The rationale for these changes is generally based upon a combination of process-level tests against observations or against cloud-resolving or large-eddy simulation models (see Section 8.2), and on the overall quality of the model simulation (see Sections 8.3 and 8.4). These developments can, and do, affect the climate sensitivity of models. All this says is that climate models are a work in progress. However, it also acknowledges that they can only hope to improve parameterization. In reality they need more and better data, but that is not possible for current or historic data. Even if they started an adequate data collection system today it would be thirty years before it would be statistically significant. The large spread in cloud radiative feedbacks leads to the conclusion that differences in cloud response are the primary source of inter-model differences in climate sensitivity (see discussion in Section 8.6.3.2.2). However, the contributions of water vapour/lapse rate and surface albedo feedbacks to sensitivity spread are non-negligible, particularly since their impact is reinforced by the mean model cloud feedback being positive and quite strong. What does “non-negligible “ mean? Is it a double negative? Apparently. Why don’t they use the term significant? They assume their inability to produce accurate results is because of clouds and water vapor. As this review shows there are countless other factors and especially those they ignore like the Sun. The 2001 TAR Report included a table of the forcings with a column labeled Level of Scientific Understanding (LOSU). Of the nine forcings only two have a ”high” rating, although that is their assessment, one is medium and the other six are “low”. The only difference in the 2007 FAR Report is the LOSU column is gone. Despite some advances in the understanding of the physical processes that control the cloud response to climate change and in the evaluation of some components of cloud feedbacks in current models, it is not yet possible to assess which of the model estimates of cloud feedback is the most reliable. The cloud problem is far more complicated than this summary implies. For example, clouds function differently depending on type, thickness, percentage of water vapor, water droplets, ice crystals or snowflakes and altitude. A number of processes, other than surface albedo feedback, have been shown to also contribute to the polar amplification of warming in models (Alexeev, 2003, 2005; Holland and Bitz, 2003; Vavrus, 2004; Cai, 2005; Winton, 2006b). An important one is additional poleward energy transport, but contributions from local high-latitude water vapour, cloud and temperature feedbacks have also been found. The processes and their interactions are complex, however, with substantial variation between models (Winton, 2006b), and their relative importance contributing to or dampening high-latitude amplification has not yet been properly resolved. You can’t know how much energy is transported to polar regions if you can’t determine how much is moving out of the tropics. The complete lack of data for the entire Arctic Ocean and most of the surrounding land is a major limitation. 8.6.4 How to Assess Our Relative Confidence in Feedback to controls Simulated by Different Models? A number of diagnostic tests have been proposed since the TAR (see Section 8.6.3), but few of them have been applied to a majority of the models currently in use. Moreover, it is not yet clear which tests are critical for constraining future projections. Consequently, a set of model metrics that might be used to narrow the range of plausible climate change feedbacks and climate sensitivity has yet to be developed. The IPCC chapter on climate models appears to justify use of the models by saying they show an increase in temperature when CO2 is increased. Of course they do, that is how they’re programmed. Almost every individual component of the model has, by their admission, problems ranging from lack of data, lack of understanding of the mechanisms, and important ones are omitted because of inadequate computer capacity or priorities. The only possible conclusion is that the models were designed to prove the political position that human CO2 was a problem. Scientists involved with producing this result knew the limitations were so severe they precluded the possibility of proving the result. This is clearly set out in the their earlier comments and the IPCC Science Report they produced. They remained silent when the SPM claimed, with high certainty, they knew what was going on with the climate. They had to know this was wrong. They may not have known about the political agenda when they were inveigled into participating, but they had to know when the 1995 SPM was published because Benjamin Santer exploited the SPM bias by rewriting Chapter 8 of the 1995 Report in contradiction to what the members of his chapter team had agreed. The gap widened in subsequent SPMs but they remained silent and therefore complicit. I am 58.. never seen anything close to this for late March. 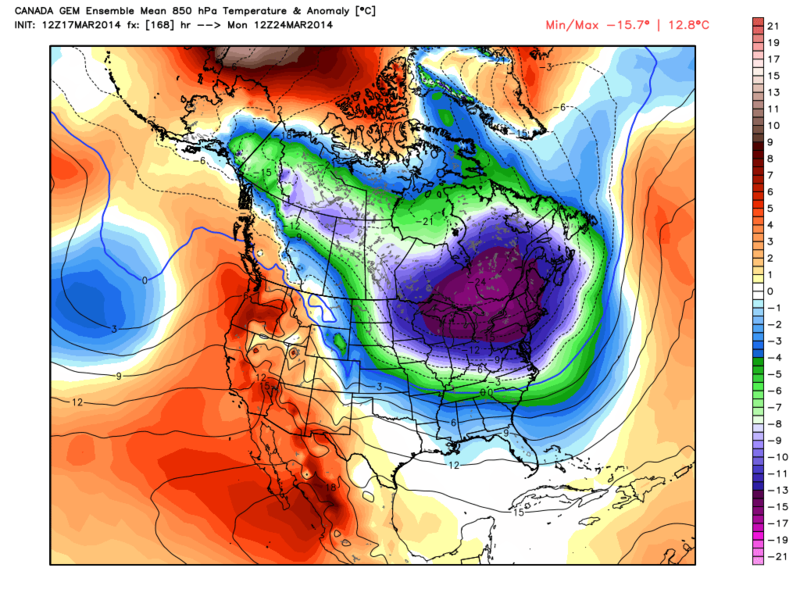 [The] pattern next week has as much extreme potential for the time of the year as I can find. 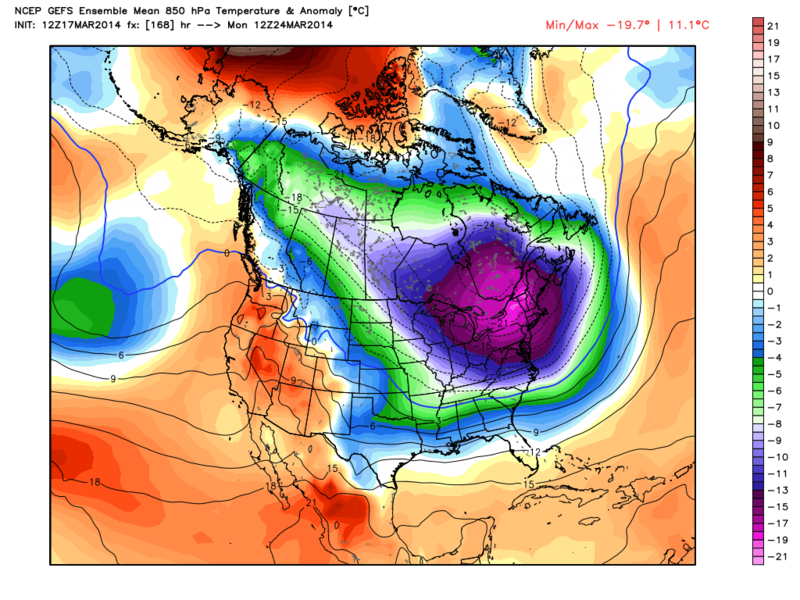 Coldest opening to calender spring in 50 yrs at least. ECMWF 12z (WMO-Essential) 850-hPa temperature + wind streams. 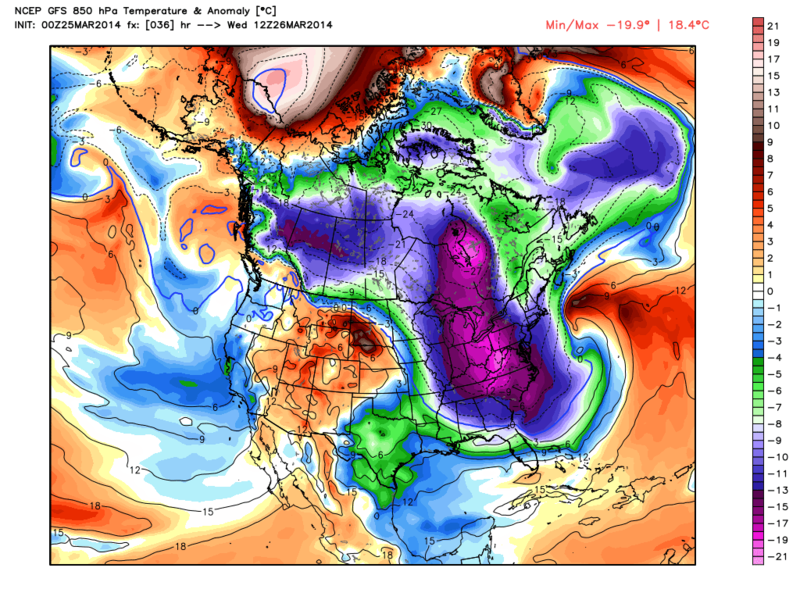 Final 10-day outcome after 2nd Arctic blast. Brutal. If Lake Michigan can open up a bit, then this cold could drop enormous amounts of Lake Effect snow on Lower Peninsula of Michigan.